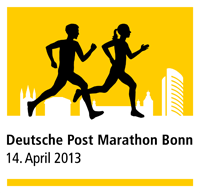 Having not laced up a running shoe in anger since 2004 I took the plunge and entered the April 14th, 2013 Deutsche Post Bonn Half Marathon. All this took place in mid-July, 24 hours after my thrombosis removing operation and in a typically male-and-macho burst of 'life-changing' enthusiasm... all whilst pumped full of pain killers; IV and oral! Breaking News 20th April 2014: OK, so that was less than successful. This time on a more positive note - I was invited to join www.go4cycling.com for their Paris-Roubaix weeked. A dream of a lifetime. The Saturday 142 km with 34 km of pave challenge and Sunday pro-race 'Belgium hopscotch' all required a slight shift in training focus. So, let's re-focus and get the legs doing what they have evolved* to do - time to get a toe hold and re-learn to run slowly for long distances. I shall endure, allegedly. A plea on Facebook for a training ideas and plans led me to the following run-walk program by Jeff Galloway. 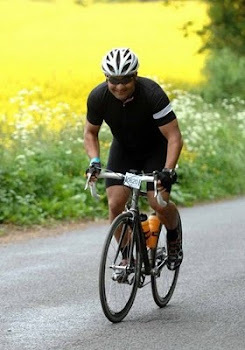 His basic conditioning 8 week schedule has been adapted to allow for continued cycling but is in essence as he presented it - with the dual primary aims to offer an injury free approach to increasing running mileage whilst allowing the body to adapt to the use of minimal footwear. A big thanks to all my Facebook friends for all the tips especially Tony Poole for the Jeff Galloway pointer. Should I achieve this then running injury and pain free... well, that will be a first. Memories of being unable to drive home from the track due to shin-splints and groin pain, will be consigned to history. Hoping not to overtrain and also to continue with the body transformation. My 'steady as she goes' body transformation so far... 2007 = 122 kg, today (April 2014) = 94 kg. 2014 Goal #2: breach the 85 kg body mass boundary (anytime before 2015!)... this was my Rugby League playing 'weight' when I was at my fittest, fastest and healthiest (aged 19-24). The latter being my primary motivation today - no more hypertension medication please! Diet: As far as I can, without obsessing, I shall go for a plant based eating plan - inspired, as so many before me have been, by Scott Jurek and Rich Roll. I want this to be sustainable so I won't beat myself up if the occasional steak or Flanders stew creeps is. The nutritional side is a very exciting learning adventure. Initial feedback... my daily general energy levels are definitely higher and I seem to need smaller portions to feel sated. What else I'll be doing... I'm also following The Sufferfest 10 week Intermediate Road Cycling Plan and am, at time of writing, at the week 7-8 transition stage. RUNNING TARGET: 5th Bonner Night Run: 10 km. I'll use the Half Marathon pre-training Conditioning Program to get me up to the 10 km level. Aim: gradually improve impact conditioning, improve cycling base fitness and technique. NB... at this point last year... A HORRENDOUS COLD, URT infection, Man-flu, Plague... you name it, I had it! (historical reference, e.g., Tues: 25.xi.2012. Feeling good for the first time in three weeks. Left it an extra day or so to allow the immune system to return to its Thor-esque levels. So, 20 mins on the Inside Ride e-motion rollers (Serotta Ottrott) + The Sufferfest 'Fight Club'. 1 h 20 mins of indoor cycling in all. Feel great! Now... let's head on to the trails! My plan is to adapt the following from mid-December, now late-April ... the conditioning programme is working very well. No need for the run-walk timer as the Garmin Edge 800 bike GPS computer is proving perfect for the task with its programmable workout tool. Easy and very, very useful. This program is designed for those who have been doing some running or walking for a few weeks. If you think that you need more conditioning before starting the program, use the “Conditioning Program”. Note: This is the minimum that I’ve found necessary to finish with strength. If you are already running/walking more than this amount and are able to recover between workouts, you may continue to do what you are doing—but be careful. 1. I don’t recommend that first-time half marathon participants try for a time goal. Do the first one to finish, running/walking at a comfortable training pace. 2. To begin this program, you should have done a long run/walk within the past 2 weeks of at least 3 miles. If your long one is not this long, then gradually increase the weekend run/walk to this distance before starting this program. 3. (Runners) What is my current level of performance? Read the chapter in the book on “Choosing The Right Goal...”. After you have run 3-4 “magic miles” (MM), multiply by 1.2. This tells you what you are currently capable of running in a half marathon right now (at a very hard effort), when the temperature is 60° F or below and when you have done the long runs listed in the schedule. Even in the half marathon itself, I don’t recommend running this fast—run at the training pace that was comfortable for you on your last long runs. 4. (Runners) What pace should I run on the long ones? Take your MM time and multiply by 1.3. Then add 2 minutes. The result is your suggested long run pace per mile on long runs at 60F or cooler. It is always better to run slower than this pace. 5. Walkers and runners should pace the long one so there’ no huffing and puffing—even at the end. 6. When the temperature rises above 60° F: runners slow down by 30 seconds a mile for every 5 degrees above 60° F. Walkers slow down enough to avoid huffing and puffing. 7. Run-walk-run ratio should correspond to the pace used (Runners). 9 min/mi— 4 min run-1 min walk... this is my goal for the Bonn half. 9. It is fine to do cross training on Monday, Wednesday and Friday if you wish. There will be little benefit to your running/walking in doing this, but you’l increase your fatburning potential. Don’t do exercises like stair machines that use the calf muscle on cross training days. 10. Be sure to take a vacation from strenuous exercise on the day before your weekend runs/walks. 11. An optional pace run TT is noted on the Tuesday run. To get used to a pace you want to run in the race itself, time yourself for a mile, and take the walk breaks as you will do them in the race. Note: This is the minimum that I’ve found necessary to prepare for the goal. If you are already running more than this amount and are able to recover between workouts, you may continue to do what you are doing—but be careful. 1. I don’t recommend that first-time half marathoners try for a time goal. Run the first one to finish, running mostly at a comfortable training pace. 2. To begin this program, you should have done a long run within the past 2 weeks of at least 5 miles. If your long one is not this long, gradually increase the weekend run to this distance before starting this program. 3. What is my current level of performance? Read the chapter in the book on “Choosing The Right Goal...”. After you have run 3-4 “magic miles” (MM), multiply by 1.2. This tells you what you are currently capable of running in a half marathon right now (at a very hard effort), when the temperature is 60° F or below and when you have done the long runs and speed training listed in the schedule. 4. What pace should I run on the long ones? Take your MM time and multiply by 1.3. Then add 2 minutes. The result is your suggested long run pace per mile on long runs at 60° F or cooler. It is always better to run slower than this pace. 5. Pace the long one so that you aren't’ huffing and puffing—even at the end. 6. When the temperature rises above 60° F: Slow down by 30 seconds a mile for every 5 degrees above 60° F on long runs and the race itself. 7. Run-walk-run ratio should correspond to the pace used. 8. It is fine to do cross training on Monday, Wednesday and Friday if you wish. There will be little benefit to your running in doing this, but you’ll increase your fat-burning potential. Don’ do exercises like stair machines that use the calf muscle on non-running days. 9. Be sure to take a vacation from strenuous exercise on the day before your weekend runs. 11. To prepare for your goal, 800-meter speedwork is included on non-long-run weekends. To compute your pace for the 800-meter (2 laps around a track), take half the time of your goal pace per mile, as you decided according to #10 above, and subtract 15 seconds. 12. Warm up for each 800-meter repeat workout by walking for 5 minutes, then jogging very slowly for 5-10 minutes. Then do 4-8 acceleration-gliders (see the segment about this in “Drills” chapter of Galloway Training book). Reverse this process as your warm down, leaving out the acceleration gliders. 13. Walk 2:30 to 3 min between each 800-meter repeat. 14. At the end of the first lap, walk for 10-30 seconds—but don’t stop your stopwatch. The time for each 800 should be from the start until you finish the second lap. 15. If you have recovered from the weekend workout on Tuesday, run a mile at race pace (noted as “p” on the Tue line). After an easy warmup, run 4 of the cadence drills (CD) and 4 acceleration-gliders (Acg). These are described in the Drill section of my Galloway Training book. Then run a mile segment at goal pace, taking the walk breaks as you plan to do them in the race. Jog for the rest of your run. 16. On long runs and the race itself, slow down when the temperature rises above 60° F: by 30 seconds a mile for every 5 degrees above 60° F or more. 17. It is fine to do cross training on Monday, Wednesday and Friday if you wish. There will be little benefit to your running in doing this, but you’ll increase your fatburning potential. Don’t do exercises like stair machines that use the calf muscle on non-running days. 18. Be sure to take a vacation from strenuous exercise on the day before your weekend runs.